Posted on August 31, 2018 by Genezaret Quintana. This entry was posted in Being Active and tagged Being Active, Dawg Dash. Bookmark the permalink. As summer winds down, it means the 33rd annual Alaska Airlines Dawg Dash is fast approaching! Over the years, thousands of UW staff, faculty, students, community members, and friends have participated in this one-of-a-kind race through UW’s Seattle campus, forging an incredible sense of accomplishment and community all while supporting education through student scholarships. Participants of all levels can partake in the 10K run or 5K run/walk on Sunday, October 14. 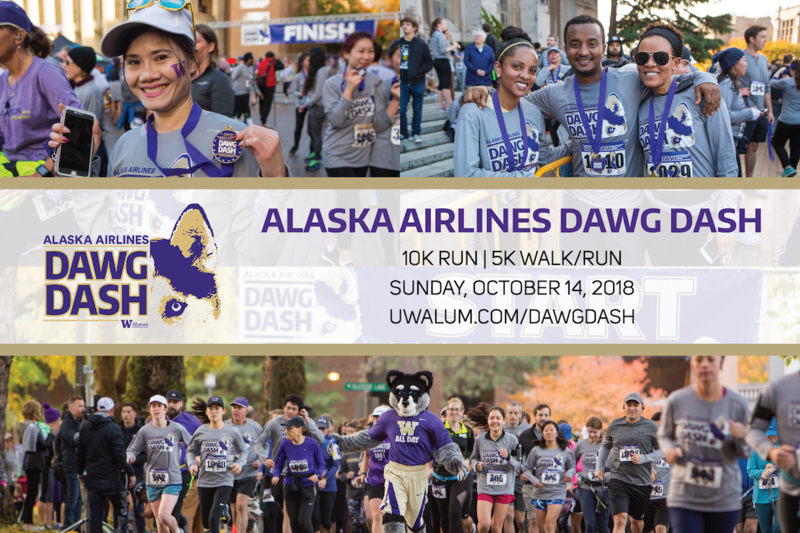 As though you needed another reason to sign up, The Whole U is inviting all UW faculty, staff, and students to join our very own Whole U Dawg Dash team! As a member of the team, you will receive $5 off registration with our discount code through September 12 along with a 6-week race training plan. Additionally, all Whole U Dawg Dash team registrants are invited to a training run/walk on Wednesday, September 19th at 5:30 PM at the UW Track—a chance to form new friendships while getting physically and mentally fit to perform at your best. Funds collected from the race will help support the Homecoming Court Scholarships, which are given to students who demonstrate outstanding UW and community impact. Any additional funds that are raised help support various scholarship opportunities as they arise. After the race, stop by this year’s Homecoming game on October 20 against Colorado to see how the UWAA supports students’ education! After the race, there will be a post-dash bash to celebrate the end of your 5K or 10K with friends, family, and fellow dashers! The celebration will include free food, beverages, entertainment, and more (including a lot of donuts!). Get your kids moving while you cool down from your race during the Post-Dash Bash with a Husky Pups Run. During this free mini event, children 10 & under are able to run with Harry the Husky and will all receive a ribbon for participating. Having trouble finding a babysitter, but dying to get outside on a perfect fall weekend to run? You’re in luck, as Dawg Dash welcomes jogging strollers! Strollers are allowed on both routes, although the 5K course is especially stroller-friendly. So bring your child along and finish strong—together! The Alaska Airlines Dawg Dash is also a dog-friendly event; in fact, it was chosen as Editor’s Pick for best dog-friendly run in the USA by runrepeat.com. With bowls of water at each water stop and the finish line, your dog could help spur you to a new personal best. If you’re all about the hardware, you’re also in luck. This year, the University of Washington Alumni Association has redesigned the race’s medal and is excited to award the first 4,000 finishers a new and improved collectible medal for you to wear with pride and display to your friends and family. Think of it as the perfect desk accessory to keep you motivated with fun memories and positive vibes all year round! In addition to the redesigned collectible medal, the UWAA will also be giving away a free, commemorative Brooks running shirt with the Alaska Airlines Dawg Dash logo to the first 4,000 registrants. Sport the shirt on your next workout to show you helped support UW student scholarships and a look that’s both sporty and smart. In training for the race over the course of the next month and a half, you’ll be giving your body the necessary exercise and cardio it needs to get you through your work week and streaking into the weekend in top form. Completing the race is cause to celebrate your own health and wellness and focus on its importance in connecting and strengthening all aspects of your life. Experiencing the sights and sounds of an early fall morning on the UW campus is something special on its own, but doing so amid the energy and enthusiasm of countless others is something else entirely! Whether you enjoy taking in fall foliage, the crisp and invigorating October air, or the fresh smell of rain after a light late-night drizzle, there’s no better place to run a race in Seattle than right here at UW! Whether you’re aiming to set a new PR or just looking for some extra guidance, a huge benefit of registering for the Alaska Airlines Dawg Dash as part of the Whole U team is you’ll receive a 6-week training plan for the race of your choice—10K run, 5K run, or 5K walk. After completing the race, you can continue using the training plan as a reference and guide for your next big event! Interested in forming your own group or running as an individual for the Alaska Airlines Dawg Dash? Awesome! Register here and enjoy a discounted registration price for UW faculty, staff, and students! Even if you’re not interested in participating in the races, you can always help keep the pack moving by volunteering. All volunteers will get a free Dawg Dash shirt. Groups welcome! Please email Nicole Howard at nhoward7@uw.edu for more information.